TRex Technologies empowers others to expose their thoughts, ideas, and business through creative web design concepts. The famous phrase "If you build it, they will come!" only applies if people know where to find you. This translates perfectly into the planning and building of a website. 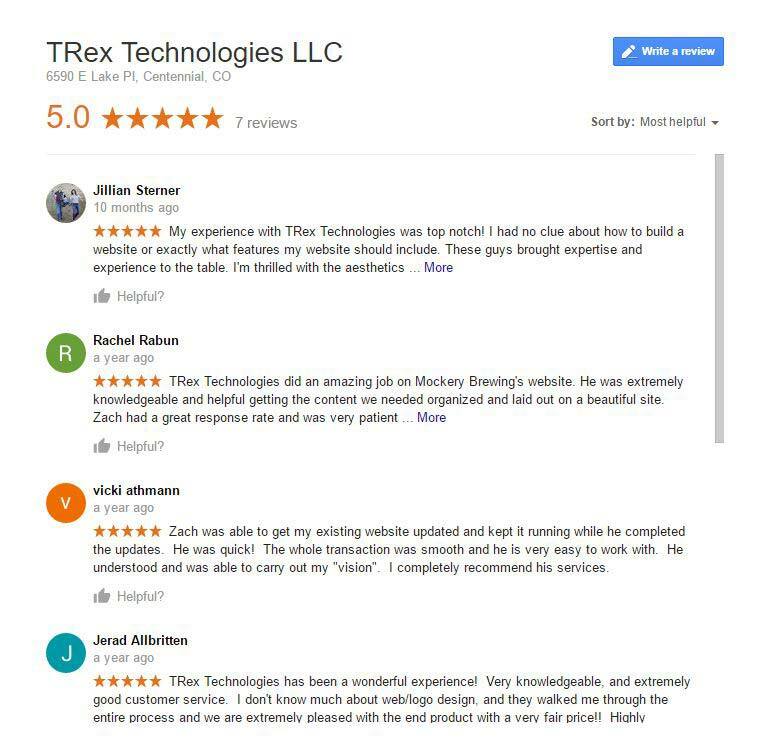 At TRex Technologies we specialize in finding out your target audience, implement tactics to pull more eyes to your site, and build a website to capture as many of those prospects as possible. This is all done utilizing the latest SEO friendly coding standards, cross platform frameworks, and mobile responsive techniques. Adaptive and responsive user interfaces (UI) which works on any device. Convenient and simple navigation of your key content. High quality and validated code. Decreases page load times and minimizes cross browser viewing issues for a better user experience. Proper keyword research and implementation. Optimizing your chances of being found faster and easier by potential audiences. Platform independent frameworks. Delivering websites that work with all major browsers, and require little or no updates to the framework for years. All from your favorite devices. We specialize in fully responsive websites so no phone, tablet, laptop or computer suffers when viewing your site. Our websites are designed and developed to be mobile first, meaning one website for all device types. We can ensure that major search engines, such as Google and Bing/Yahoo, view your site as a "mobile friendly". This optimizes your chances of being ranked higher in search results, and offers a better user experience across a wider range of users. Reliable Website Services - Always! Just take it from our customers. Our reviews speak for themselves. Website development is our key focus. We offer a wide range of web services on just about any website. Whether you are looking to enhance an existing website, make simple text/image updates, or build a brand new website, we are here to help. Our website developers and designers have the experience and knowledge to get the job done right, the first time. View our portfolio of work as a testament to our ability and knowledge. We pride ourselves on delivering services that meet and exceed our customers expectations within a timely and professional manner. Let us help expose your thoughts, ideas, and business through creative web design concepts. Web Designs People Remember - and your competition envies! Our work is our pride, and we love sharing it with you. We strive to make websites that our clients can be proud of and that their customers remember. Your website is your electronic storefront, and according to Google, over 90% of new customers that are not from referral will find you through the web. Leaving a positive, lasting impression with your website visitors ensures they view you as the professional you are. We have over 20 years of Web Development Experience across multiple platforms, dating back to 1997. Over 25 websites have been built and deployed by us in the last 2 years. Out of all the projects we've completed since our beginning, we have zero unsatisfied customers. We live in an ever evolving technology world. Today over 50% of all Internet searches are done from a mobile device. TRex Technologies specializes in responsive, mobile friendly websites so that your viewers always have access to the information they need. A responsive design improves user experience and accommodates devices of all sizes. Sometimes keeping things simple is best. Your website can be unique and beautiful, but it needs to be easy to use. Fast to load and easy to navigate can go miles with your users. Why makes things more complicated with navigation menu's that no one can understand or use. We design all of our sites so that navigating them couldn't be more simple. Search Engines are complex and ever always changing. Slight updates to search algorithms can have major impacts on where you rank in search results. Having a site that optimizes the chances of ranking as high as possible is crucial. Proper meta tags, titles, keywords, content and framework architecture need to work together to present optimally to search engines. Anyone can build a site on these pre-templated website generators like Wix or SquareSpace. But do you really want a site that looks like your competitors, and thousands of other sites on the web? Our unique web design helps you stand out in the crowd. We will work with you to create your vision, and give your customers a site they never forget. Adaptive and responsive User Interface (UI) which works across any device. Convenient and simple navigation so all your users can find what they are looking for with ease. A step above the rest. Something that your customers will love and your competition will envy. New Website built on Drupal 7. Responsive, Subscription based Service. New mobile responsive Wordpress site which was an upgrade from a legacy Joomla site. Hosted with TRex Technologies. Our customer testimonials are proof that we deliver exceptional results over and over. TRex Technologies was able to get my existing website updated and kept it running while he completed the updates. They were quick! The whole transaction was smooth and they are very easy to work with. They understood and were able to carry out my "vision". I completely recommend their services. TRex Technologies has been a wonderful experience! Very knowledgeable, and extremely good customer service. I don't know much about web/logo design, and they walked me through the entire process and we are extremely pleased with the end product with a very fair price!! Highly recommend TRex Technologies!! TRex Technologies LLC went above and beyond my expectations of building my business web site, Mary Martha's Floral Design & Event Planning. Thank you Zach for your expertise! I highly recommend TRex for your business. TRex Technologies did an outstanding job getting my web site up and operational in a very short time frame. Zach made all of the hard work transparent to me. He not only took care of the issues, but he also did the development very rapidly. Working to meet my time line and making the adjustments I requested after I change my mind. I couldn’t be more pleased with the attitude, professionalism, responsiveness and value I received from TRex Technologies. I am very pleased to endorse Zach Ploen and TRex Technologies. I am confident you will fill the same way. My experience with TRex Technologies was top notch! I had no clue about how to build a website or exactly what features my website should include. These guys brought expertise and experience to the table. I'm thrilled with the aesthetics and functionality not to mention the stellar customer service. Not once did I feel overwhelmed, confused or scared about my website. They were very thorough and took care of our needs every step of the way. I highly, highly recommend TRex Technologies!! TRex Technologies did an amazing job on Mockery Brewing's website. He was extremely knowledgeable and helpful getting the content we needed organized and laid out on a beautiful site. Zach had a great response rate and was very patient working with us on this project. We continue to use TRex Technologies for updates of beers and content to the site and couldn't be happier! Thanks, Zach! Give Us A Shout - We're Here To Help! Custom Web Design and Development Services, Specializing in Mobile Friendly Websites.